A second consecutive down day for the euro vs dollar pair yesterday, with the currency pair ending the trading session with a narrow spread down bar with wicks to both top and bottom, which paint a neat picture of the price action yesterday – indecision and uncertainty. 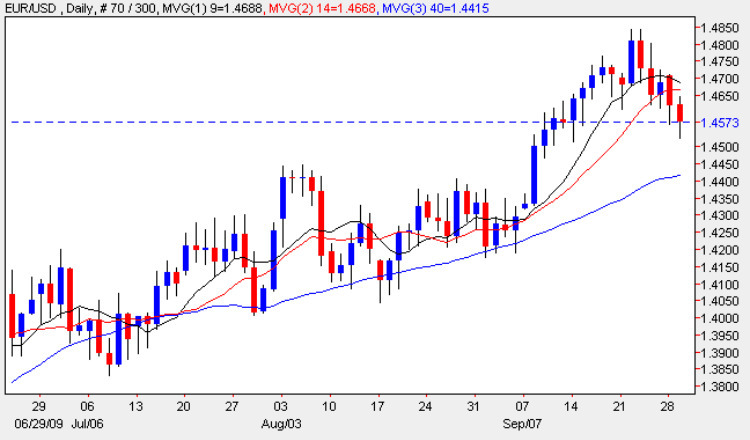 Whilst the short term trend is lower, a view reinforced by Monday’s break below the 9 and 14 day moving averages, the speed of the move is far from convincing, suggesting that this is simply the market taking a breather following the breakout from the major congestion area created in the summer months. Indeed, were this a true reversal, then we should have expected to see some wide spread down bars in the move, indicating heavy selling pressure, which to date have failed to appear. My technical view of the euro vs dollar therefore remains the same, which is bullish in the short to medium term, and with the strong platform now in place below, we should see a surge higher in due course, and a break and hold above the 1.48 price level as we look towards our initial 1.50 price target in the medium term.